Our genealogy folders are made up of three separate collections: ancestral charts, Putnam County Historical Society Genealogy folders, and the Boatright folders. You can use the search box below to search for a last name contained in any of these three collections. The Ancestral Charts are a collection of nearly 200 files that were complied and donated to the Putnam County Public Library by our patrons. They are arranged alphabetically by surname. Our genealogy folders were originally donated by the now defunct Putnam County Historical Society. New folders and information have been added over the years. Currently this collection contains approximately 200 folders that are arranged alphabetically by surname. William J. and Florence Boatright belonged to a number of local organizations over many years, including the Putnam County Historical Society. Additionally, she was a member of DAR (Daughters of the American Revolution) and William was a member of SAR (Sons of the American Revolution). The Boatrights organized a wealth of historical information on many regional families. This information is indexed and cross-referenced by family name into 656 folders. The Boatright files are one of the most important sources of genealogical information in our archives. Each Boatright folder has been scanned and can be viewed online. Search for a last name. 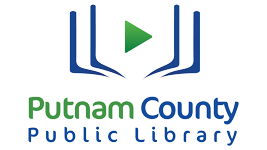 Putnam County Public Library © 2014. All Rights Reserved. Powered by WynWay Technologies.